The city of Kingston upon Hull, to give it its full title, has been in celebratory mood all year since becoming UK city of culture. Hull has certainly been re-inventing itself over the past decade and what better way to celebrate than with twelve months of cultural events? Arriving at the City Hall on the Friday evening, we were welcomed at the door by IAO General Secretary Alan Taylor. 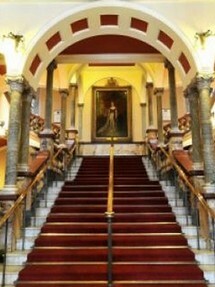 Recognising old friends as we ascended the grand entrance staircase amidst civic opulence and chandeliers, we entered the reception room to meet Sarah Beedle at her stall promoting the IAO and its Organists' Review magazine. Here we were given a goody bag along with some most useful sticky notes. Further along there were stalls complete with leaflets, journals and books for BIOS, the RCO, HEROG (Hull and East Riding Organ Group), and Hilary Whiteley with a wide selection of organ music CDs. I eventually succumbed and made a few purchases, including the Andrew Freeman photographic collection 'In search of Organs' that BIOS was offering at a most advantageous price. It being quite a heavy volume, I was grateful for Sarah's goody bag. 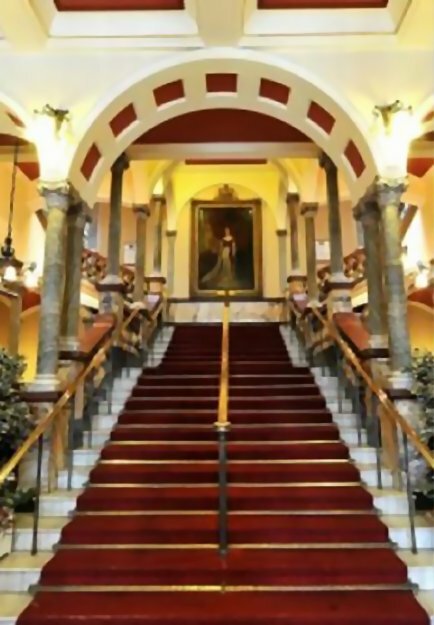 The City Hall contains a superb Edwardian concert hall built on a grand scale, complete with a 1911 Forster & Andrews / 1951 Compton / 1991 Rushworth & Dreaper organ of no less than 141 stops. This instrument is perfect for the performance of music on a grand scale. 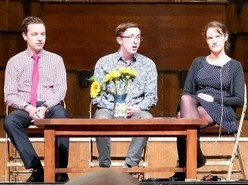 By 6.30pm there were well over two hundred of us in the audience. 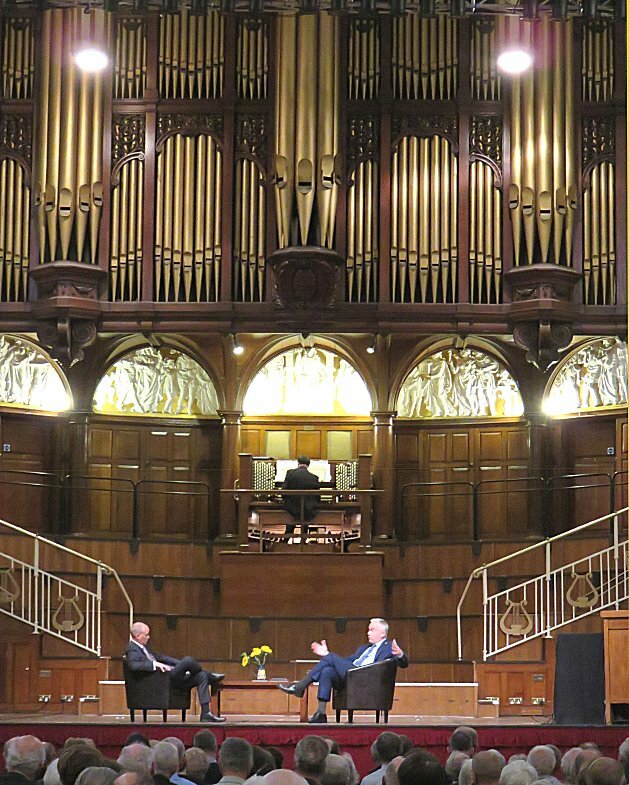 Following the official welcome by John Pemberton (Organ Curator at the City Hall), we welcomed BBC TV personality Huw Edwards, who was interviewed by Gordon Stewart about his choice of organ music for a ‘Desert Island’. 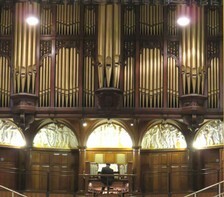 The pieces chosen, which included RVW's Rhosymedre, The Storm by Lemmens and Widor's famous Toccata, were played ‘live’ on the City Hall organ by John Scott Whiteley. Huw spoke about his childhood, growing up in Wales, attending chapel and the influence of music. He spoke passionately about the decline of these aspects of the traditional Welsh landscape and underlined the need to preserve our heritage for the future; not just representative buildings, but the instruments within them. 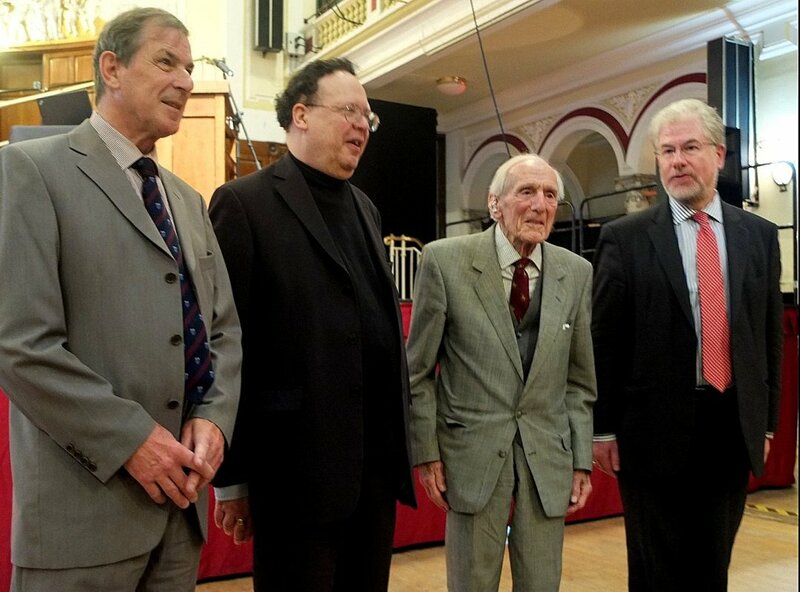 The next item on the programme was a series of short presentations by the promoters: Colin Wright for HEROG, Alan Thurlow for BIOS, David Saint for the IAO and Philip Meaden for the RCO. Thanks were expressed too for the generous support given to OrganFest 2017 by the Bramall Trust and Hull City Council. 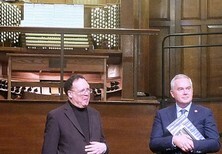 A non-organist member of the audience was overheard to have found them “interesting, informative and well delivered”. We moved on to the second musical event of the evening: a recital by Colin Walsh (Organist Laureate, Lincoln Cathedral). His programme of French Romantic organ music opened with the Grand Choeur in D by Guilmant, which he followed with works by Saint-Saëns and Tournemire, the rarely-heard Prélude Funèbre by Guy Ropartz and the whole of Vierne’s Third Symphony. Colin played with dazzling virtuosity and displayed his deep understanding of the works using many subtleties of tone colour of the instrument. Day Two commenced with a recital containing works connected with Hull-born composer Alfred Hollins, including four of his own compositions and two pieces played by him in his recital programmes here. Darius Battiwalla (whom we congratulated on recently becoming Curator of the Leeds Town Hall organ) displayed more virtuosity and pedal technique with flawless performances of the Hollins Concert Overture in C minor, A Song of Sunshine, and finishing with the Concert Toccata in B♭. It was a delight to hear the flowing counter melodies - so integral to Hollins compositional style - soloed out on imitative orchestral registers. Darius made it all appear so easy! I was interested to see that Bach's Andante (which turned out to be the second movement of the Fourth Trio Sonata) was included in recitals given by Hollins. The use of the more delicate flutes with mutations over an 8' pedal made this a delightful sorbet between the rich Full Swells and Great chorus-to-reeds heard in the louder pieces. 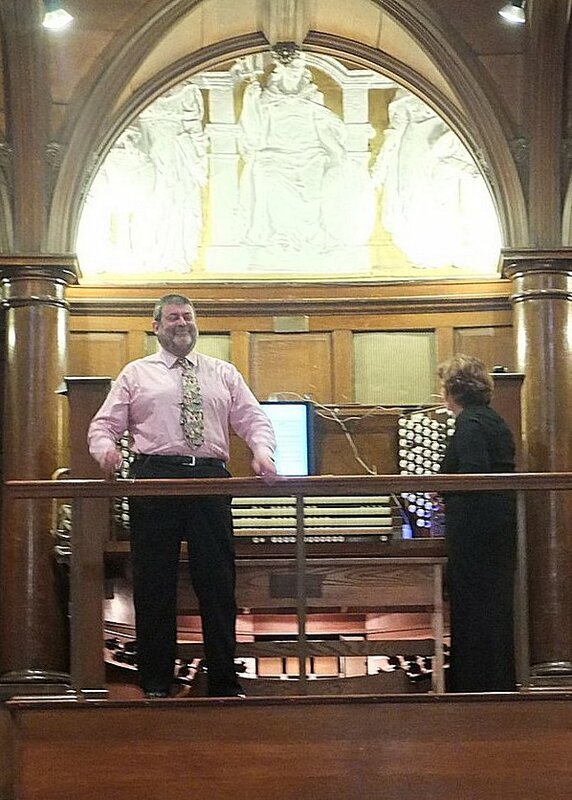 John Pemberton (Organ Curator, Hull City Hall) followed with a talk on the firm of Hull organ builders Forster & Andrews who operated from premises in Charlotte Street, just around the corner from the City Hall. 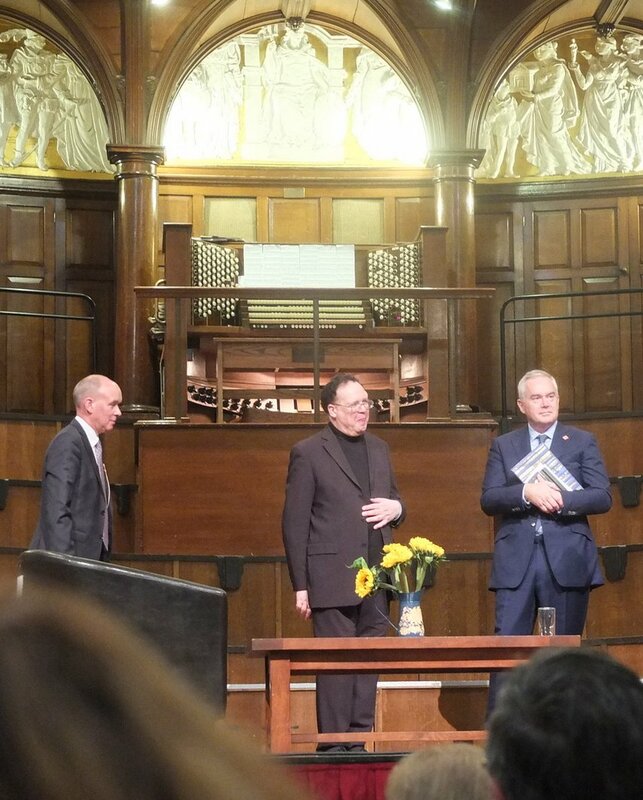 John, who has an encyclopaedic knowledge on matters F&A, traced the history of the firm and detailed the links with the German organ building traditions through Schultz. It is always tempting to speculate about a "what if…", and I found myself wondering about the hypothetical outcomes had the post-War rebuild been by H&H, Walker, HNB, GDB, instead of Compton. 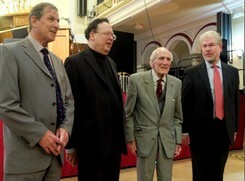 The session leading up to lunchtime was a talk by the RCO’s Andrew McCrea entitled 'Dr Jackson at 100'. With the composer present in the audience, Andrew outlined some of his pieces for organ from the 1944 Impromptu through to the 2004 Sixth Sonata, enhanced with ‘live’ performances of excerpts played by John Scott Whiteley and Colin Wright. Andrew drew our attention to the music’s connection with people, events and places such as the historic Schultz at Armley in Leeds. At the end of the talk following applause for Andrew, there was a roaring and standing ovation for Francis. The wonderful thing is that Dr Jackson is still composing. During the Saturday lunchtime recess, I overheard "This is like a mini congress...focussed totally on the organ". He was quite right, I reflected: a weekend totally focussed on the instrument we all love to hear and/or play. Following lunch, John Scott Whiteley assisted by Robert Poyser on the organ gave an excellent presentation on The Orgelbüchlein Project. I learnt so much during this 45 minutes about the structure of the existing pieces by Bach, what was missing, and the new compositions that have been commissioned to complete the collection. With examples and scores projected onto the large screen, I was totally absorbed and can't wait until the complete collection is published when I will be able to buy a copy. 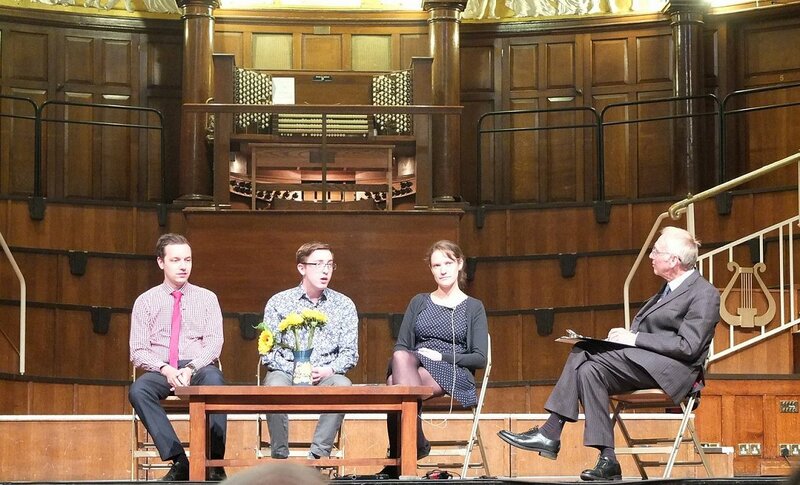 The Young Organists' Forum that followed was chaired by Alan Thurlow of BIOS in conversation with Maximillian Elliott, Jeremy Lloyd and Hilary Punnett. The question "How did you come to the instrument?" elicited answers that ranged from “starting lessons by accident”, “because I could reach the pedals” and “knowing where the key was kept”. The ensuing lively discussion included items about how we should be promoting ourselves in order to interest potential young players, supporting places that have a good instrument and countering apathy by showing them what can be done with it. 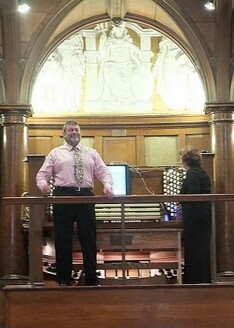 The afternoon passed quickly and all too soon we reached the Grand Finale Recital by Kevin Bowyer. A totally eclectic programme of organ music and arrangements for organ provided ample scope to display some of the available ‘theatre organ’ stops. Starting with a blaze of reeds, a virtuoso performance of Bach's Prelude and Fugue in D firmly declared that this was not going to be a historically informed performance - but colourful and exciting it certainly was! Kevin explored every department as new tone colours appeared with each new piece. I particularly appreciated The Grasshopper's Dance by Ernest Bucalossi, which used the Xylophone stop. This is at 4' pitch on the Solo manual with 37 notes re-iterating. I wonder if I could add one to the Lewis at my church? The final item on the programme was Ernest Tomlinson's Triumphal Overture, which should be heard more often. Finishing in a blaze of what must have been full organ with octave couplers and double pedalling, the Grand Finale was a real Town Hall programme on a real Town Hall instrument. As I returned home, we all agreed that OrganFest 2017 had been superb. Full marks are due to all the organisers for providing such a sparkling programme of people, events and music. What a wonderful weekend!